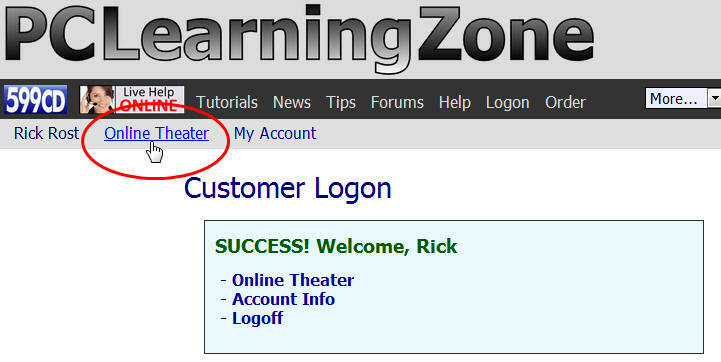 Logging on and viewing your lessons in the Online Theater is quick and easy. You will find it's just like watching videos on YouTube. You can access your lessons from any computer, and there's no additional software to load on your computer. The first step is to log on to your 599CD account. Look for the Logon button on the menubar across the top of the screen, just below our logo. You can also click here. NOTE: Use the email address and password you provided when you placed your order with us. If you have lost or forgotten your password, visit our Account Information Center to get a new one. If you are not a customer yet, and just want to try out the Theater to see if you like it, you can use the link on the very bottom of the web site in the "Try Us" section (or just click on that link). 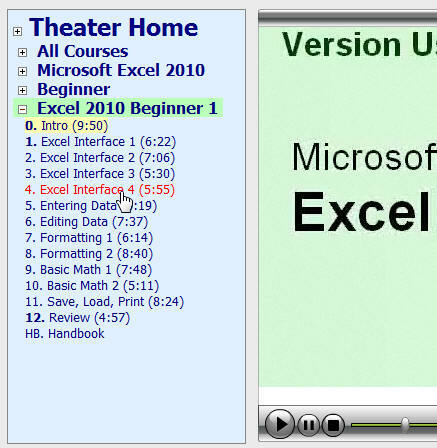 Now, to watch your videos, click on the link on the menu bar that says "Online Theater". You will now see the Online Theater page load up. Again, you should see a "Welcome" message with your name. 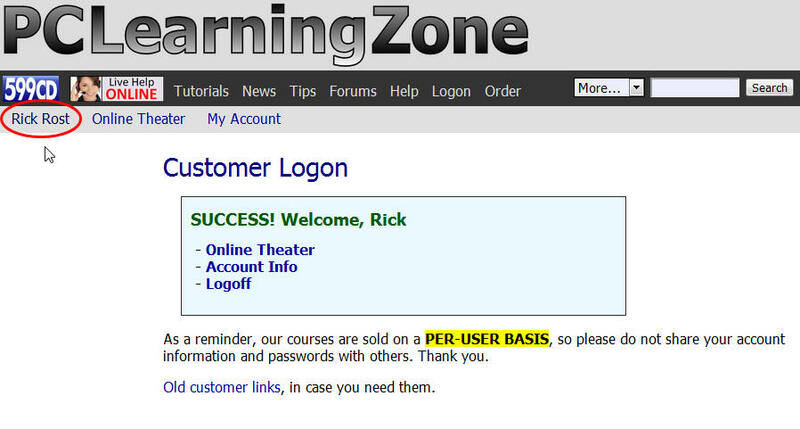 This means you are successfully logged in to the Online Theater. Note that some older browsers have a problem with "third-party cookies." If you see this message, then follow the links provided for the alternative login method. Now the first video for this course will load up and start playing. You can switch to another video by simply clicking on it in the navigation menu in the upper-left corner. 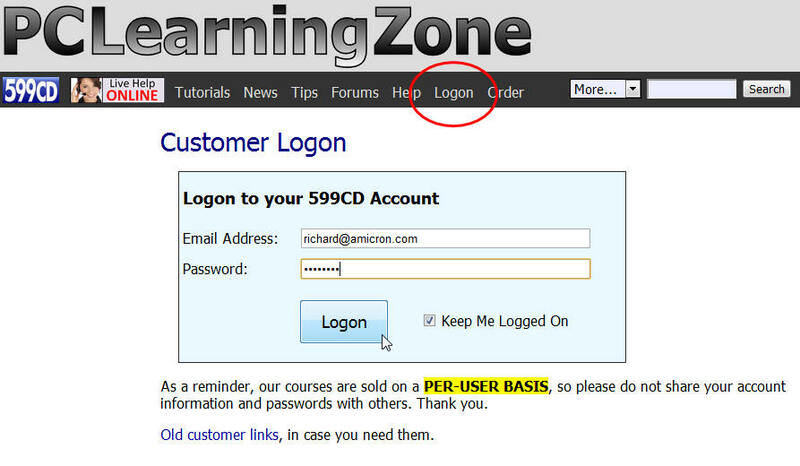 Now, if you HAVE purchased the lesson and think you should have access to it, contact customer service. However, keep in mind that if you leave the Theater up on your screen without clicking on anything for TWENTY (20) MINUTES, you will be TIMED OUT. This means you'll have to log back in again. That's not a big deal. Just click on the "Online Theater" link again at the top of the page and the site should log you right back in. This happens all the time. People watch a couple of lessons, then go away for lunch and come back... and get timed out. So just log back in again and you'll be all set. The default player for our videos is the FLASH player. This is the same video player technology used by many popular sites, including YouTube. If you are able to watch videos on YouTube, then you shouldn't have any problems watching them on our site. You must have Adobe Flash Player installed in order to use this player. Flash comes pre-installed in most newer browsers. If you want to change to a different player, you can. All of our videos are also available in Windows Media Player, and some of our newer videos will also load in an HTML5 player. You can change the player type in the Settings window. We do recommend you stick with the Flash player whenever possible. When each lesson video loads, you should also see the Class Discussion Forum appear below the video window. You can read what the other students have said about this lesson, including any questions they might have asked, and answers from the instructor. If you scroll down to the bottom of this window, you can also discuss the lesson by asking your own questions. If you change the "My Courses Only" option to Yes, then you will only see those courses which you own (have purchased) up in the Navigation Box, instead of seeing everything. Notice now if I click on the "All Courses" category, you can see that I only own courses in the Word, Excel, Access, and Active Server Pages topics. If you purchased the optional supplemental Handbook that goes with most of our video courses, you will see a link at the bottom of the lesson list for your handbook. Click on it. You will see a link appear to download your handbook. If you just click on the link, the handbook may open right in your browser. If you want to save the handbook, then right-click on the link and select "Save Target As..." to save it to your PC. In either case, you will need the latest version of the Adobe Acrobat Reader software in order to view the handbook. It's a free download from Adobe. The link is provided on the download page. Well, that's about it. As you can see, using the Online Theater is quick and easy. 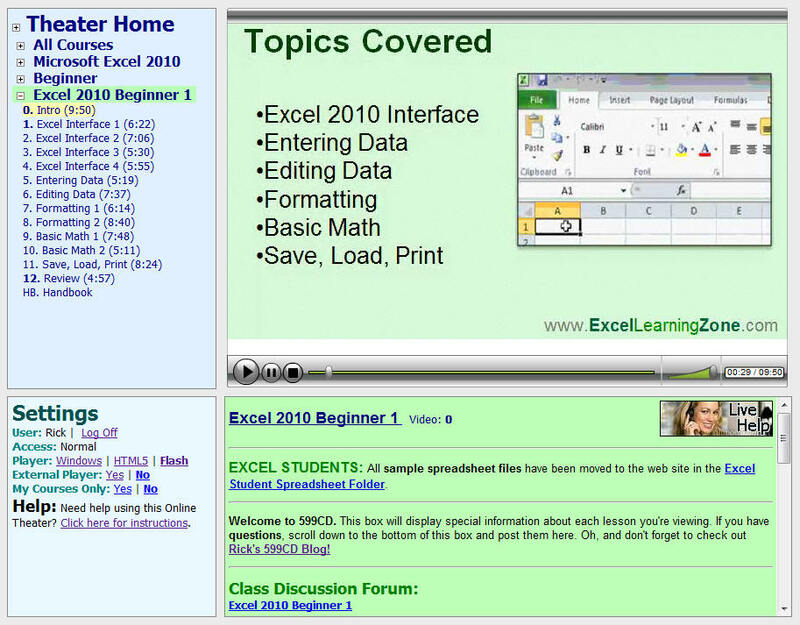 There's no additional software to download, and you can watch your videos and view your handbooks from any PC connected to the Internet. Enjoy! If you have any questions, please contact customer support.